This article examines the overseas behaviour of Chinese non-governmental organisations (NGOs) in two African nations, Ethiopia an Malawi, with varying political regime types. Our inding suggest that, irrespective of regime type, Chinese NGOs have yet to make a substantial impact in either nation. We argue that, espite the strength o the Chinese state an high level of international development assistance given, domestic politics and regulatory frameworks in host nations still matter a great deal. Our study suggests that the Chinese model of international development will continue to be one in which temporary one-off projects are favoured; and, insofar as social organisations will play a role, they will be in the domain of government-organised NGOs rather than grassroots NGOs. Hsu, J., Hildebrandt, T. and Hasmath, R. (2016) “‘Going Out’ or Staying In? 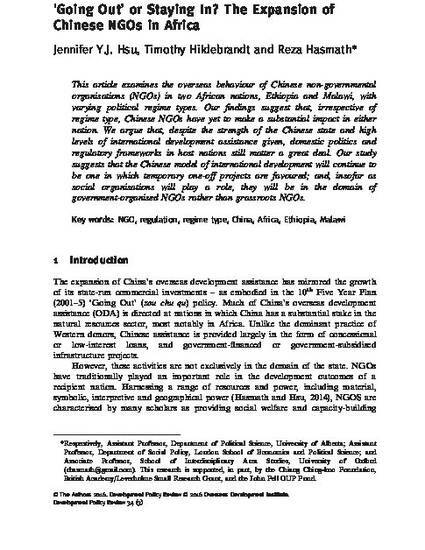 The Expansion of Chinese NGOs in Africa”, Development Policy Review 34(3): 423-439.